Your homeschool group should be filing some reports every year with the IRS. Did you know that? 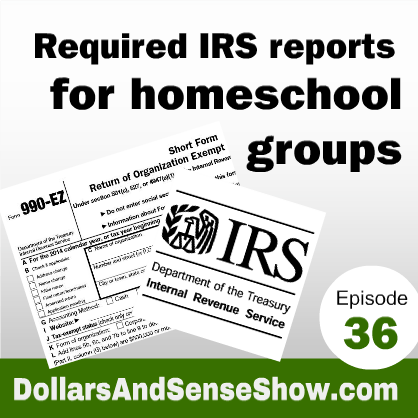 Carol Topp, the HomeschoolCPA, explains what forms homeschool groups should be filing with the IRS in this episode of the Dollars and Sense Show podcast. We were told if our income is under $25,000 a year, we don’t have to file anything with the IRS. Is that true? What changed? We never had to file anything with the IRS before! But we’re not a 501c3 organizations (or don’t want to be), so why do we need to file anything with the IRS? We don’t like government intervention. Why do we need to have anything to do with the IRS? Our homeschool group doesn’t make any profit, so why do we have to file a tax return? We’ve never filed anything with the IRS? We didn’t know we had to! Now what? Will be owe back taxes? Here’s a helpful FAQ page explaining the IRS Form 990-N.
How to get added to the IRS database to file the Form 990-N. If all this is new to you, don’t panic! We can arrange a phone consultation with your homeschool leaders. Together we can sort out what needs to be done. Homeschool group waiting to file for 501(c)(3) status..what are they? Better for a homeschool group to file for 501c3 or pay taxes? If our homeschool co-op operates under 501c(3), are all the fees paid by members tax deductible for them? No, the member fees are not tax deductible donations because the member received a service in exchange for those fees. If a member gives cash (or goods) above and beyond the membership fees (and receives nothing in return), then that cash is a tax deductible donation.